In this post I am exploring the ways that I have changed my blog posting practice. 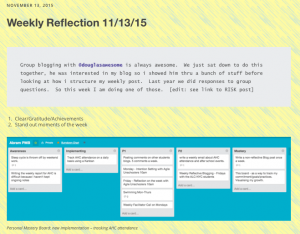 I differentiate passion/think pieces from reflective posts, show where each has value and offer suggestions for posting weekly reflection blog posts as part of an ALC reflective cycle. This piece started as a comment/response to one of the Endor ALC students (@lucylove) weekly reflective posts. I’ve only been working with that Agile Unschooling group for a week but have already found plenty of inspiration for innovation in my own practices in that time. 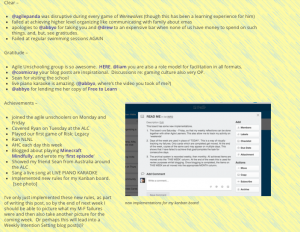 I’m writing this as a way to support easier blogging practice for ALC people who either aren’t sure where to begin (but want to) or are unsure of the value of their practice (but still want to). Key point is that this is intended for an audience of people who want to blog. It is my hope and belief that a community of active ALC bloggers will eventually reach a threshold that will prove the value of the practice to others. I’m not trying to convince anyone who isn’t already interested in blogging. I doubt they’d have read this far anyway, right? In my own blogging practice, there are currently two key types of Blog Posts. Reflective Posts – these are mostly looking back at what has happened and recording it for posterity (or yourself). Am I mainly writing this for other people or am I mainly writing this for myself? (Nosey family members and friends included). Often the writing becomes blurred: I’m often writing for an imaginary future me and so even the think pieces are ways of recording my ideas for future consideration. Even as I write this I’m wondering… is that what I really think/feel right now? Do I agree with that? Aha! There’s a hint: if I’m really concerned about what I think and what I am saying it’s probably a Think Piece. Alternatively, if I’m more concerned with keeping a record, it’s probably a Reflective Post. I’ve found that Reflective posts tend to want to be formatted for ease of both writing and reading. When Lucy talked about structure I think what she was reaching for was a way for her to pour all of the content from the week into one post. She didn’t want to leave big gaps. She ended up using a bullet-list for each day of the week and writing something about each day. Perhaps this is obvious to many of you, but being able to look back at all of the great things I’ve been doing feels like a super-power. It reminds me of my progress when I’m feeling overwhelmed. It acts as both a diary and a port-folio. It holds me accountable to myself – I keep saying I should swim more, i better make this a priority! It holds me accountable to others – It allows my friends and family to check in on what I’ve been up to. It helps me do the things I do better – when I reflect on my practice I can record areas for improvement. There are other many other ways that reflective posting creates value. What are your thoughts? 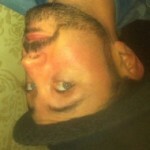 @abbyo @ryanshollenberger @tomis @bear @drew @liam please share/comment on this post! “Categories” is a level 2 Spell. 1. *Create a category*. Right now you are leaving all of your posts as uncategorized by default. Differentiate the weekly reflection from other, more free form posts. Maybe you aren’t writing ‘weekly reflections’, maybe you are doing a group blogging question or re-telling your favorite joke. Wouldn’t you love to be able to look at all of those together? It’s easy to do. 2. *Create a (simple) TITLE format*. The less thinking required here, the better. Trying to think of a funny, witty title every week for a post who’s primary purpose is journaling/archiving is counter-productive. This could just be my preference, but I like to keep the catchy titles for stories/posts that I really WANT other people to read. 3. *Decide on content /framing/ in advance*. Structure of my post: An intro/summary (pre-formatted), contents list, Personal Mastery Board, C/G/A, Stand out moments. The goal here is to prevent you from stopping and thinking too much. Think pieces get the catchy titles and respond to your passions and interests. 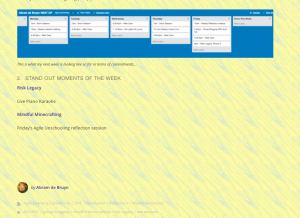 Weekly reflections are simpler and serve different purposes. By framing things in advance you will end up writing more in your posts and worrying less about ‘what to write about’. Make things easier for yourself! [note: I may have over complicated my own post structure, be Agile]. So that’s my Think Piece blog post on Weekly Reflection Blog Posts. Meta. Disagree or have thoughts on anything in this post? COMMENT IS FREE. One more thing before you all teleport back to your corner of the interwebz.